I could eat these wonderful Dessert Empanadas all day long. Make it easy and prepare the dough ahead of time and keep in the freezer. 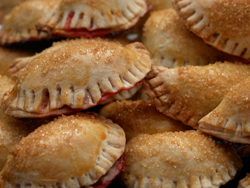 If preparing for a dinner party and want to make the dessert ahead of time, the baked empanadas can also be frozen. Just take out what you need that morning to thaw. Once thawed, warm slightly in the oven and then roll in the sugar/cinnamon mix. Cream butter and cream cheese together until well blended. Beat in the flour. Form into a ball and wrap in saran wrap. Refrigerate for couple hours or over night. The dough will keep up to a week. Remove dough from refrigerator 30 minutes before using. Dough should be cold but not refrigerator cold. Preheat oven to 375°F. Roll chilled dough thin. Using a round cookie cutter or a large mouth jar, cut into 3 to 4 inch rounds. Place small spoonful of fruit in center of each round, moisten edges with milk. Fold round over and press or crimp edges together with a fork. Bake 375°F on ungreased cookie sheet 15 to 20 minutes. Immediately roll in mix of sugar and cinnamon.